Just because you can see water doesn't mean you can drop a line in. Catch & Release is a program of catching a fish and throwing it back as quickly as it is caught - with no more than a few seconds to take a picture. It is required in certain waters and of certain fish. 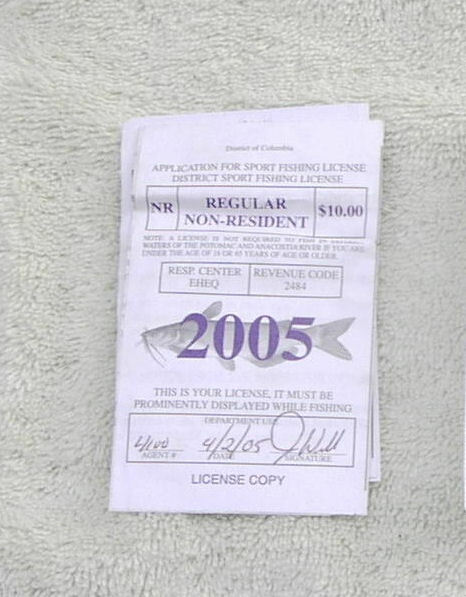 Fishing licenses can now be purchased on the Web; just Google "[enter state] fishing license". Sports Authority, Wal-mart, K-Mart and others also usually stock licenses for the state you are in. Note that some states have only freshwater licenses, while others will have fresh, salt, and ... trout. Make sure you have all the ones you need! There is a "slot limit" on age as well: between ages 16-65 you will most probably be required to have licenses. Beware: some fish are legal only during certain months of the year and only of certain (minimum) size! A slot limit is a fish that fits between a range - usually inches; think 10-14": a 12" fish is good to go; 15" throw back - or pay a hefty fine. Yes, not only fish get caught, but fishermen. If caught fishing without a license, the fine can be noticeable; $50 minimum is not uncommon and some can go over $150, if caught with a fish too small, too large, or not in season. In the DC area, I wouldn't think of keeping any striped bass I caught because the rules change monthly. Just keeps it simple. Note that DC is NOT reciprocal!